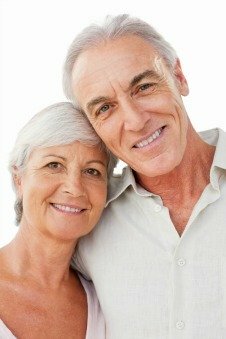 Geographic Atrophy - What Is It and Is There Any Treatment? Geographic atrophy (GA) is considered late stage dry age related macular degeneration. Atrophy is the the wasting away or the deterioration of cells or systems. You usually hear these words in association with muscle atrophy - which is the loss of muscles due to lack of use or exercise. However, in the case of our macula - the center of the retina responsible for our straight ahead, sharp detailed vision - the cone cells waste away due to lack of oxygen and nutrients and the inability to get rid of built up waste products. Here is a picture of geographic atrophy from the National Eye Institute. 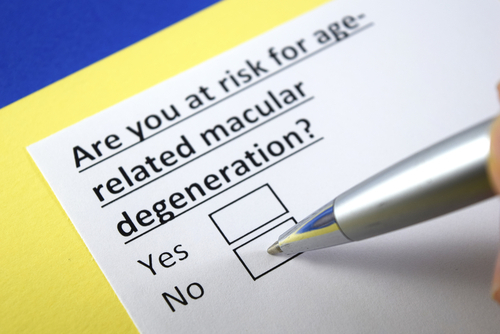 Dry or atrophic macular degeneration (AMD) is identified by three macular degeneration stages. AMD is a progressive eye disease. Each eye may be in a different stage. √ Circular patches of partial or complete depigmentation of one of the layers of the retina, the retinal pigment epithelium. (RPE). These changes in the RPE may stabilize or they may progress. "Degeneration of RPE cells leads to the death of rods and codes. What an eye doctor sees in a dilated eye exam in a patient with GA is like a continent of atrophy surrounded by a sea of retina. The continent appears different from the surrounding retina because of the loss of the pigmented RPE cells. 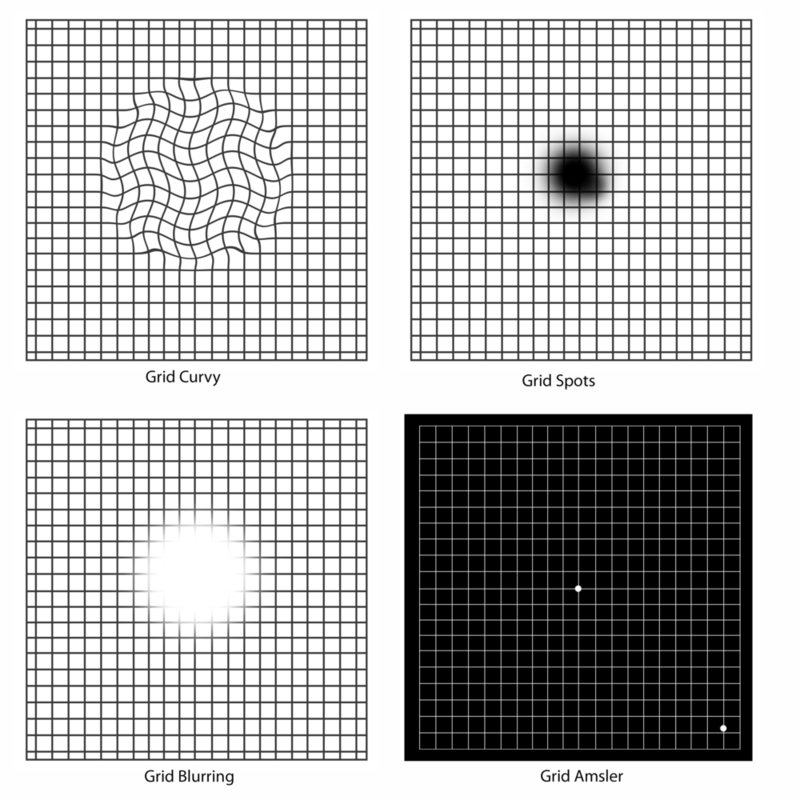 Areas of geographic atrophy look whiter than the surrounding retina." The area of atrophy will determine the amount of vision loss. Dr. Michael A. Samuel, a retina specialist and author of Macular Degeneration: A Complete Guide for Patients and Their Families,describes geographic atrophy as, "the end stage of dry AMD, where central vision is lost." This loss of our straight ahead vision is called a central scotoma - it is a gray or black spot that appears in the center of one's vision. "Forty percent of people with GA require print to be twice as large after 2 years of worsening," says Dr. Sunness. Dr. Sunness states that "more than half of patients with GA in one eye develop GA in the other eye." There are several AMD clinical trials that are investigating new ways to treat advanced AMD. A January 16, 2019 news release from the National Institute of Health reported that "Ten weeks after the human iPSC-derived RPE patches were implanted in the animals' retinas, imaging studies confirmed that the lab-made cells had integrated within the animal retina." Taking a patient's own blood cells, researchers are able to convert the blood cells into induced pluripotent stem cells (iPSC). This type of cell can then be "induced" to become any type of cell. 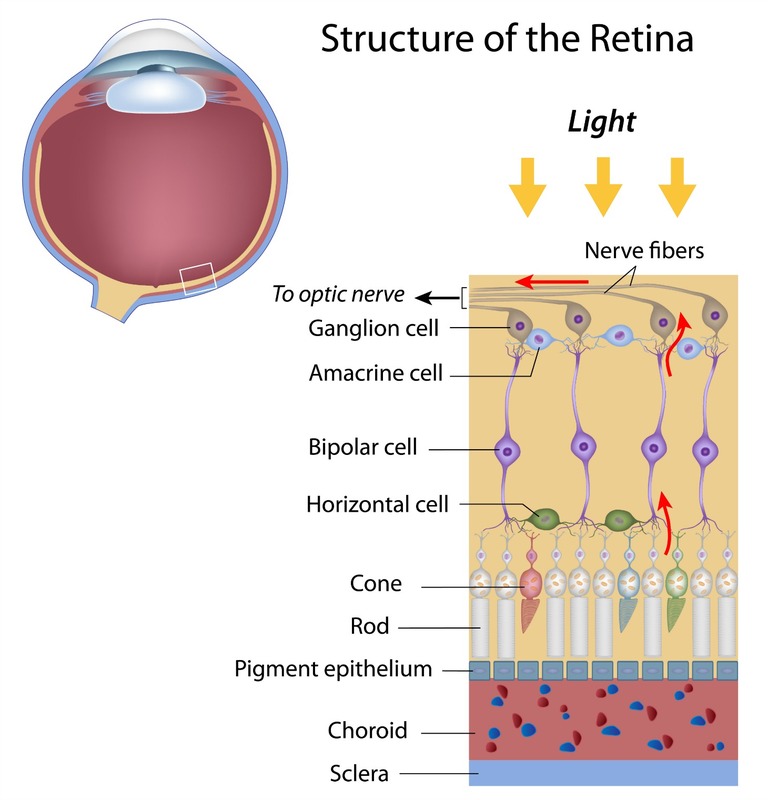 By programming the stem cells to become retinal pigment epithelial (RPE) cells and transplanting the the patch of healthy RPE cells between the patient's RPE and photoreceptors, the layer of photoreceptor cells can now be supported to prevent any further death of the rods and cones. Since the patient's own blood cells are used, the chance of rejection of the RPE transplant is minimized. "If the clinical trial moves forward, it would be the first ever to test a stem cell-based therapy derived from induced pluripotent stem cells (iPSC) for treating a disease," said Kapil Bharti, Ph.D., a Stadtman Investigator and head of the NEI Unit on Ocular and Stem Cell Translational Research. This study is in Abiline, Texas. It is a "stage 1 patient-masked, dose-escalation, safety evaluation of brimonidine intravitreal implant. Patients will receive implant in one eye and "sham" treatment (meaning no treatment) in the fellow eye. Stage 2 will begin after 1 month of safety has been evaluated for Stage 1. Stage 2 is a randomized, double-masked, dose-response, sham-controlled evaluation of the safety and efficacy of brimonidine intravitreal implant in patients with GA from age-related macular degeneration."